She couldn’t get the pictures and stories she saw on the news out of her mind. A 3-year-old killed by his mother’s boyfriend. Marcus Fiesel locked in a closet and left for dead. Karen White kept asking herself, What can I do to try to stop this from happening? What would make me feel better, make me feel like I’m doing something for these kids? She became a foster parent. 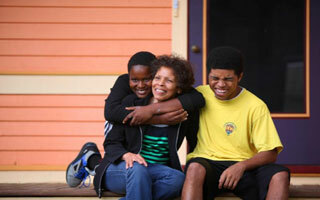 Since, White and her two boys – Khafra, 19, and Vincent, 11 – have been a temporary family to more than a dozen kids. She’s licensed with Lighthouse Youth Services. She and her boys tell stories about the kids – she mostly takes school-age boys – who have lived in their house. One loved to go next door to “Cadillac Larry’s” because Larry worked on cars and would talk to the boy while he did it. Some of the kids stay a couple of weeks, some have stayed months. One was adopted by a family who lives nearby, so White still sees him occasionally. One recently called her on his birthday. HCJFS workers are happy when they see a new placement land in White’s home. White is just a delight to work with, said worker Emily Moore. White likes fostering because she likes to watch as the kids’ lives change.